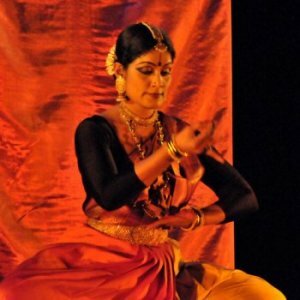 Trained by exalted classical Bharatanatyam Gurus, celebrated as a consummate classical dancer, Geeta has worked at erasing orthodoxies in the world of classical dance. And it is this mission that has led her to undertake unusual collaborations; she has worked with painters, musicians, puppeteers and theatre persons to create new works of contemporary relevance that intrigue the intellect. Geeta Chandran believes that art can change the world and that artists can show the path. 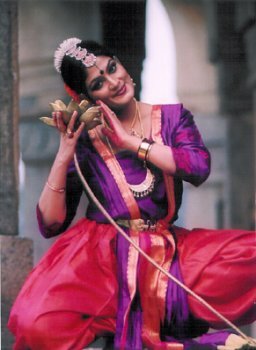 She is celebrated not only for her deep and composite understanding of the art of Bharatanatyam and performance, but also for her Carnatic music (she is an accomplished vocalist), her work in television, video and film, theatre, choreography, dance-education and dance-issue journalism. Founder-President of Natya Vriksha, where she teaches Bharatanatyam, Geeta has conducted the arangetram debut performances of 25 senior disciples whom she continues to mentor, and who have blossomed as full-fledged performers. Geeta is also Artistic Director of the Natya Vriksha Dance Company. You are known for linking dance intimately with social causes. Are there NGOs that you work with closely? 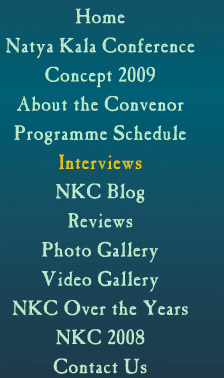 Which of your choreographies were directly inspired by your experiences working in an NGO? I have never been just associated with any particular NGO. But I am certainly consistent in the causes I promote. I work for a better deal for women and the girl child in our society. In this I have partnered with innumerable national and international organizations in presenting the widest variety of performances looking at the gender theme through various windows: women and peace, female foeticide, the issue of dowry, the issue of equal space for women, etc. etc. I think health is an issue today. And in promoting health issues, I have worked with the WHO (World Health Organization), the Heartcare Foundation, with CanSupport, and the Cancer Society of India. I think peace in South Asia is a critical issue, and I have worked with the Dalai Lama Foundation towards this goal. In all cases, it is the issue that seduces me. As a member of several academic committees, do you think schools have the proper infrastructure to support programs in the arts? Are there benefits for incorporating training in the classical arts in schools? It is in my experience that schools have not developed proper infrastructure to support programmes in the arts. This is a slightly complex issue. First, we do not have a structured programme for the arts in schools. Many attempts have been made – I too have been member of several such national committees – but none have succeeded in concretizing the issue. Second, and probably the critical question is: where are the trained specialists to administer arts programmes in schools? We have to first train the trainers! Third, we need not just trainers for the arts programmes, but trainers who can also motivate, inspire, improvise, all based on a solid understanding of the arts. Hence, to introduce a pan-India arts programme in schools, we would have to invest energy and resources at various points. Then there are the aspirations of the parents to deal with. Social aspiration often trivializes the learning of the arts, and only academic qualification is enshrined as a preferred societal goal. Even the most motivated of schools find it very difficult to sustain arts programmes. One of the main problems that young dancers face is earning a living while establishing themselves. What are some ways in which young dancers can finance their art? Besides scholarships, are there other government funds that young dancers can take advantage of? Budding artists are forewarned that the arts are a passion and not a profession, and we have created the entire arts patronage edifice based on that principle. Scholarships are few and far between. We have not developed any web of funding agencies that can sustain the arts. For classical dancers, joining performing dance companies could be a way out. It provides a stipend and tweaks other skills along the way. I encourage my senior students to undertake small projects in schools where they work with student groups to create works that the school students can present at various key annual events. Assisting in teaching brings in pennies and also clarity in better understanding the art form. But all these can only be done with a fine sense of balance. Time for one's own learning, growth and Sadhana cannot be compromised – ever! This is the very difficult razor edge of choices that have to be made. You are collaborating with Ramli Ibrahim in the segment titled 'In Conversation: Stretch Marks.' Is this your first time working with him, or have you both collaborated before? If you could have dinner with any famous person from the past or present, who would it be and why?